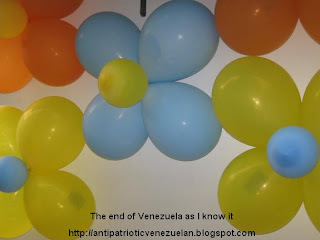 I'm preparing a few post about certain events, feelings and thoughts related with the Venezuelan political crisis. I promise I will publish as soon as I consider them decent enough. In the mean time, the next questions reached my mail box, I answered them to practice my english, and at the end I thought it would be fun to share; because even if its so off topic, this blog is at the end, a personal blog. The three or four of you who follow this blog, are invited to also answer this meme. And delayed Merry Christmas and Happy New Year 2009 to who ever has the patience to read this. My idea of perfect happiness reduces to one or two moments, short enough to remember it, long enough to enjoy it; because a constant happiness is equivalent to some boring routine that no one ever remembers as remarkable. Lions. (Really? No politics? No Chavez? No death? No… really… I HATE lions). Jane Austen, she had a very particular way of being rebel and conservative at the same time. Yep, its probably not a big historical figure, but is the only one I can think of right now. Ask me in a couple of days and I’ll probably give you a different answer. I would have to name more than one. A professor who really marked me and my boyfriend. It’s somewhere between the way I speak and some other things I don’t feel comfortable about revealing them at all! General social skills such as keeping a good conversation about stupid topics, looking good, dancing good, drinking, having a decent job or career etc etc. My feet. No doubt. Yes, I’m a girl and I have some stupid complex, what do you expect? It is impossible not to answer this question without naming the obvious: the person I despise the most is you- know- who, some guy from Miraflores, I bet you have heard of him. That I didn’t graduate on time. What? My career and writing. Who? He knows. That instinct of protection they have. Our ability to talk about nothing, I must confess that I love to talk with my female friends about nothing! I’ve always wanted to sing and dance, but I’m terrible at both things. A couple of years that I spent working as an assistant professor, I think I did something good there. It would be interesting to come back as the opposite of me, someone like my president itself or Pamela Anderson; just to see how those shoes fit. They are there, for whatever may come, without judgments. Umberto Eco, J. K. Rowling, I don’t have many favorite writers, I always read a different book of a different writer. Does Hermione Granger from Harry Potter counts? When Word corrects a stupid grammar “mistake”, or style issue and leaves that part of your document with that nasty red underline that you can’t make it go away. I dislike animals. I dislike being around talks about cruise trips I never made, and plastical surgery, and business (I have nothing to say on those conversations). I dislike the lack of opportunities, when its even hard to dream about having a decent life. I dislike a lot of journalists. And of course I dislike the world troubles like everyone does. Typically: old, surrounded by my love ones (more likely the love ones alive for that time), without a lot of pain, in peace. My mom always reminds me parts of a pray and even counting that I’m not very religious, I like it. It says that the patience can reach everything, and that everything will be over and will pass. Do you want to help Venezuela? This is for a cool project we are organizing. We are collecting emails ourselves, but we have limited time. Just this: the project has to do with education. Here you can see very clearly the development of Chavismo plotted against yearly OPEC oil prices. In red at the end you can see the current (week) average price of OPEC oil. UPDATE: some Chavista supporters came up to tell me the chart proofs Chávez wins most of the elections when prices are low. This shows again their understanding of charts. Apart from Chávez's first elections, when he was new, when he was "the new promise", all other elections he has won have been with prices higher than before. The moment of great distress for him, when he was outsted, was at a time when prices seemed to drop a bit. Of course, now Venezuela has been able to save some money, but it is much less than what Chavismo needs. When Chávez allowed, under international pressure, to have a referendum (one year after it was asked), the government was for a couple of months already giving away for free red bags full of food and a big "NO" (not to the referendum) on them. In 2004 oil prices (and thus, governmental revenues) were much higher than at any given time for many years. But of course, for Chavismo now prices are low if they are not over $100 per barrel...so corrupt has Venezuela become. I had mentioned the article in a previous post, but I just want to put it here again as I think it is an eye-popper. Oppenheimer on Latin American's state of denial on education (thanks to Hans and Ow). Venezuela was very close to the average in literacy in that UNESCO test...average for Latin American standards, that is, which is already very bad if we consider how Latin American participants score in the PISA evaluation scheme. Cuba scored by far the best, followed by Chile, Argentina, Brazil and Colombia. Venezuela was the absolute worst in maths. It was really bad. I mean BAD. Cuban children were again the best by far, followed by Argentines , Brazilians, Chileans, Colombians, Mexicans, Paraguayans, Bolivians, Dominicans, Hondurans, Peruvians and Ecuadorans. Venezuelan children came last after Ecuadorans and there was some distance between them. Since Chávez is in power Venezuela has pulled out of open evaluation schemes of education We know the situation has worsened, in spite of all the certificates of educations and in spite of Chavismo's claim of having eliminated illiteracy. 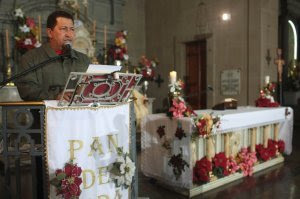 It seems that Chávez has not even learnt from one of the good things Cubans still have: an education system that was already the best in Latin America before Castro arrived in power (at least for non-graduate studies). Has any any politician in Venezuela given some thoughts to this problem? I mean: is there any politician who has taken the time to ponder about solutions that go beyond sputtering the words "more money for education", "more schools"? In fact: is there any Venezuelan who cares? Where? Where do Venezuelans come from? When I was at school we used to hear the story: Venezuelans are a mixture primarily of Indians, Europeans and Africans. I would hear that at home as well and I could see that also in the variety within my own family. One of the observations I hear from many European friends who visit Venezuela is how varied the population is. Since I am Europe I have become more aware of that. At school I learnt Venezuelan nationality is based on jus soli and there was no big deal about that. More interestingly is that most families are very mixed and I don't mean "Irish" with "Scottish" or "Northwest Africa with West-Africa", I mean mixed big time. Europe, like other regions, is currently receiving more and more immigrants from outside and even within Europe there are more and more marriages between people from different countries. This brings possibilities but also tensions. Still, it is different from Venezuela, where the kaleidoscope is so old. There is a lot of racism in Venezuela, no doubt about it. And the issue is being misused increasingly by some politicians and it is downplayed by others. It goes from every group, as often the case. Still, my impression and that of many others is racism in Venezuela is not as bad as in the neighbouring countries and definitely less so than in Europe, Asia, North America, Asia and Africa. It may have to do with the fast clash and fusion of ethnic groups from the very start and general mobility Still, racism is always bad and I think we should not avoid the issue, we should be able to discuss it openly and fight against it in a cool way. Some time ago I decided to take part in the Genographic Project and find out about my haplogroups, which show the long-term ancestry on either the far paternal or maternal sides. Scientists can find out about this because there is a series of markers that are only passed from father to sons and another set that i s only pass from mother to any child. My genealogy information disappears somewhere in the XIX Century. In my case I had no clue what I was going to get (I mean I imagine my paternal grand-grand-grandfather in 1498 could have been in Europe, Africa or the Americas), as the mixing is so great. I got my results for my paternal side already and it turned out to be J2, probably Spaniards who on their turn descended from Phoenician/Roman/Greek/Jew/Arab people or from others who arrived there earlier, during the Neolithic expansion, but anyway coming from the Fertile Crescent, where J2 appeared sometime after BC9000. And now I am waiting for my maternal side and I am also expecting anything. While I was waiting for the results on my mom's side I decided to see if I could find more about genetic studies on how Venezuela became to be. There are few things available on the Net. From two abstracts from a genetic congress I managed to do the following graphics. 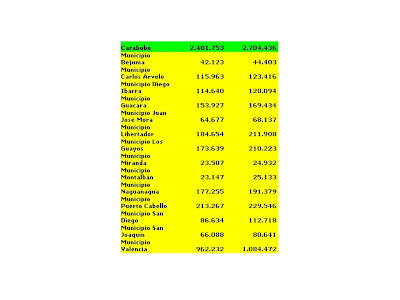 The studies were carried on a very limited sample, around 86 individuals from different regions of Venezuela. 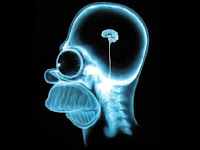 Still, I reckon it very much reflect what scientists and others thought. 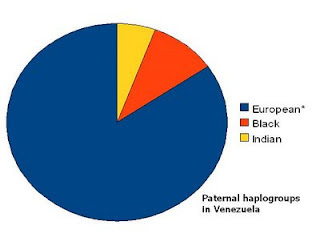 It represents the genetic background of the average Venezuelan. He has most frequently an European/Old World on the paternal side AND at the same time a Native American background on the maternal side. H e also could have a Sub-Saharan component but that is less frequent. Any of the people who are "café con leche" (coffee colour) may have primarily European ancestors from the paternal side and Indian or African ones from the other...but also many of those who are paler or darker. And it goes for almost anyone but for the groups whose ancestors just arrived one or two generations ago and a few other exceptions. Statistically speaking, my maternal line could very well turn out to be Indian, but also anything else (well, almost, I don't think there was much Tibetan influx or from Madagascar). That is Venezuela. There are some studies about specific haplogroups but I leave that to another time. * I placed "European", but in reality it is more "markers brought by Europeans". A lot of Venezuelans trace a lot of their ancestors from the Canary Islands and that region shows a lot of genetic evidence linking them with Berbers and the same is the case for continental Spain through the Moors. In my case, J2 is a minority haplogroup in Spain, but it comes from the Middle East way before the Spanish Conquista of the Americas. ** I considered which names to use for the main "groups", I decided to stick to the Venezuelan naming, I could have put European-Native-American-Sub-Saharan, but then I am Venezuelan and in Venezuela those names are used by many people whichever main "colour" that person may have on their skins.